The title actually made me laugh out loud. “Camille Pissarro. Fox Hill, Upper Norwood”. 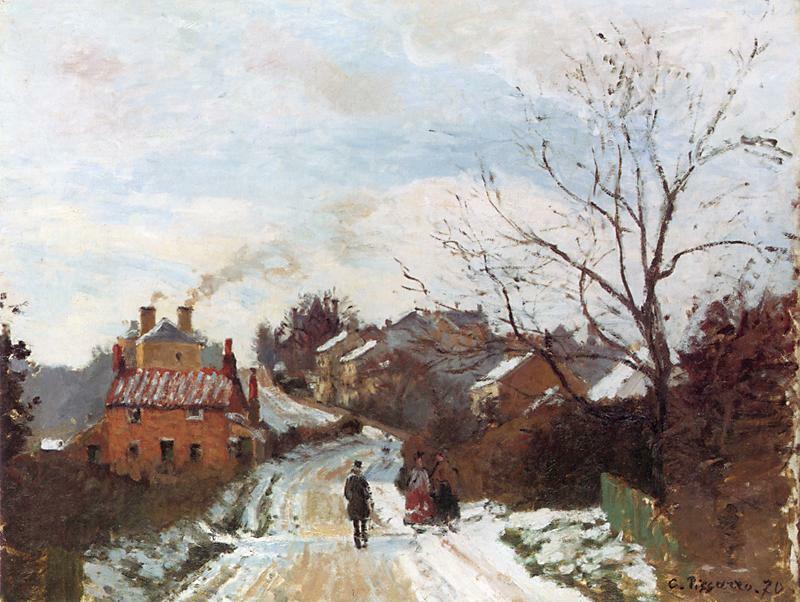 Pissarro was effectively exiled there to escape the Franco-Prussian war, and painted a number of pictures of the area, at a time when the train had just arrived but the Norwoods were still villages on the outskirts of London. It was Pissarro’s habit to paint a picture all at once (i.e. not starting with any particular subject or colour) and to keep adding paint right across the canvas until the painting was finished, on location. In this resect his technique mimics what happens as we take photographs, but this is where the simillarity between this landscape painter and most landscape photographers ends. It is only a small canves, maybe a couple of feet wide, and the subject matter is mundane in the extreme, but the way Pissarro treated the subject was radical. It was an early example of Impressionism, it was a style that he said “doesn’t catch on, not at all …” and shocked the critics by showing people going about their business in a landscape soiled by mud and litter, painted quickly and sketchily in order to better capture the natural light and athmosphere. What struck me was the contrast with photography’s insatiable appetite for new and ever more extreme locations. Every year the media are awash with near identical images of the latest trendy location as everyone tries to get that ‘new’ image by neurotically jumping on the latest bandwagon. As photographers we are at a disadvantage in some respects, in that the light falling into our cameras is recorded mechinically and is therefore less susceptible to natural variation from one practitioner to the next… but still, how often do we ask ourselves what we are trying to achieve with our image? How does it change the way people see a subject? How does it move the story on?! How many photographers even TRY to make work that a contemporary would be able to recognise as coming from them and only them, and not from any one of the other people who happened to climb off the coach to Jokulsarlon that day and witnessed the same icebergs on the same black beach in the same light? Indeed, later in life Pissarro gave up Neo-Impressionism (things had moved on in the interveneing years) saying that it made it “impossible to give an individual character to my drawing”. To say that there are not thousands of people out there quietly ploughing their own furrow would be unfair. Some of them are even making a good living doing it. And I suspect that digital photography, electronic media and the way we are swamped with images of a certain kind will prompt more people to do something different… or to surf google images and stop taking photographs at all. In the mean time, maybe we should all visit the galleries more often and see what Van Gogh could do with some olive trees, what Monet could do with a pond in his garden, or what Pissaro could do with Upper Norwood.